In a price sensitive Indian market, the hatchback segment has been a popular choice among customers. Two key players in this segment, Maruti Suzuki and Hyundai have also been the strongest of competitors. Hyundai’s popular seller Grand i10 will soon stand face to face with its newest competitor, the Ignis from Maruti Suzuki. Modern features and loads of practicality are the key factors that set it apart from the rest. Hyundai Grand i10 is powered by 1.2-litre Kappa engine which generates 82bhp of power and 116Nm of torque. The diesel variant is powered by a 1.1-litre three cylinder U2 VGT engine which generates 70bhp power and 163 Nm of torque. Five speed manual transmission comes as standard, while CVT is optional on the petrol variant. The yet to launch Maruti Suzuki Ignis will also be offered with a 1.2-litre K-series petrol engine, while the diesel will get a Fiat sourced 1.3-litre engine. Five speed manual transmission comes as standard on both the cars. However, Maruti might introduce an AMT option for the Ignis. In order to strengthen its foothold in the Indian market, Hyundai will be introducing a new Grand i10 facelift. The front will get a redesigned grille with a new mesh pattern and round LED DRLs, tweaked headlamps and tail lamps. The sides remain fairly the same as the current version except for new alloy wheel design. Moving away from the conventional design, the Maruti Suzuki Ignis gets a more upright design with large headlamps that neatly connects with the grille. The hatchback gets an SUV-like stance to appeal to the younger lot. Moreover, the Ignis has better ground clearance figures to handle Indian conditions better. The new Grand i10 gets revised upholstery with an updated choice of colour options, new instrument cluster and depending on the variant, it will get features like 7-inch touchscreen display with Apple Carplay and Android Auto. Safety features like front airbags and ABS with EBD might be offered from mid variant onwards. The Ignis from Maruti Suzuki will be sold via the company’s premium Nexa outlets, hence we can expect to see front airbags and ABS with EBD as standard on the upcoming vehicle. Moreover, depending on the variant the Ignis will be loaded with features like 7-inch touchscreen infotainment system with navigation, Apple CarPlay, Android Auto, USB, and AUX. Additionally, it will also offer automatic climate control and reverse parking sensors with camera. The new Hyundai Grand i10 and the upcoming Maruti Suzuki Ignis have everything it takes to lure customers who are looking forward to a practical car. 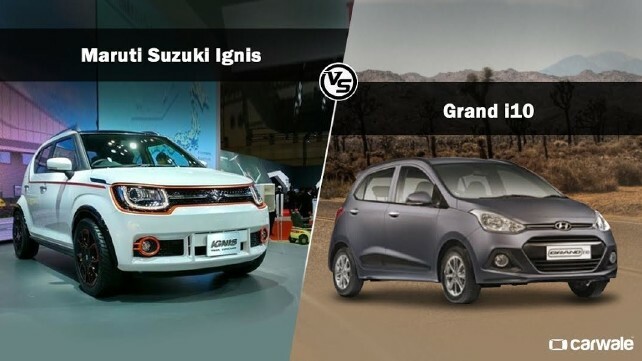 However, the anticipated slightly lower pricing of the Ignis as compared to the Grand i10 can turn the game in its favour. Moreover, the standard safety features and a modern design shall also work things in Maruti’s favour, unless Hyundai has a secret bag of surprises that will be revealed at the time of the Grand i10 facelift launch.